What comes to mind when one hears Russian word nalichnik, meaning just a window frame? For some, wooden frame is a precious memory of childhood: shutters opening to the music at the beginning of the favorite fairy-tale TV show. For some, they make a part of summer time memories: relaxed, warm, sunny holidays. Even for those turning their noses away window frames symbolize a bygone wooden world. This element of traditional national architecture is a certain favorite of everyone. But there is much more to say… Frames are tradition – keepers. Still, we do not know much about them. Even kids can tell various styles of Russian paintings. But who can say where lays a difference between Tomsk window frames and their brothers from Ivanovo? How to distinct Samara shutters and shutters at the wooden houses in Krasnoyarsk? Or give the reason why shutters are so popular in Engels, Balashov and Saratov, while Murom, Cheboksary and Tomsk can do without them? Many questions are yet unanswered by the modern science. It is known that decorated windows can be found everywhere in the Volga region. But there is no clear understanding if the tradition of decorative framing had begun there. We are not sure if the carving was a kind of a guard to protect the house and the family from evil or it had already lost its magic purpose when for the first time it appeared at some frame. It is not easy to say where carvers followed heathen motifs, where they went after church canons, or where they had some other source. 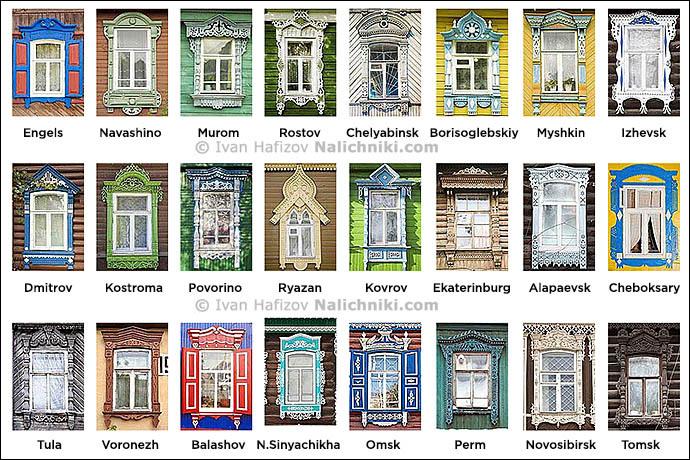 Even the borders of the territory where houses have decorated windows are not too distinctive! First of all, wood has a short life as a building material. Excavations in the ancient Russian town of Novgorod found decorated wooden elements dated as early as XI century, but the oldest wooden houses still alive were built in mid XIX century, which means they are about 160 years of age. 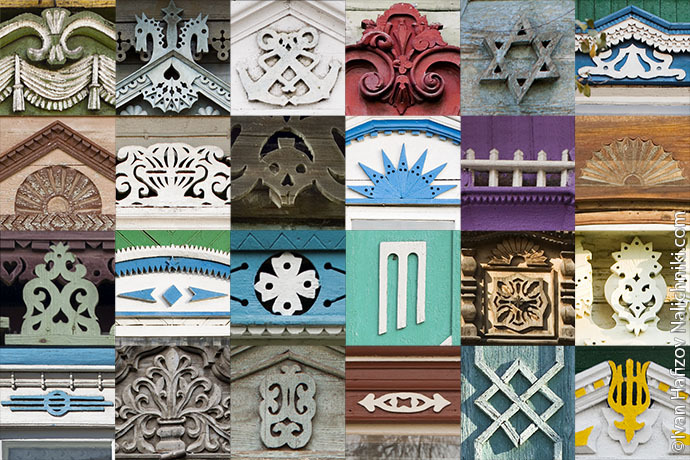 Then, though late XIX century marked the peak of the saw-through carving (the main method employed for decorated windows making), no one took it seriously. Academic science treated it as a vulgar, primitive and trite device. More or less close studies were done between 1960s and 1990s, but even they covered mostly Volga regions and some of Central Russia. This is why many quizzes are still waiting for their clues. Some of them, probably, will find one, and some will not. Yet, one thing is certain: collecting of photos and information related to decorated window must begin now, or in ten years, it shall be too late, just because more and more of these wooden houses with their painted shutters and decorated windows disappear every year. This site treats you with an enormous assortment of large, small and tiny windows decorated with carving (and not only carving). Such a giant portion of beauty makes even mature designers fell dizzy! This is why homeopathic doses of viewing are highly recommended. You are to get used to it, to come back again and again…Especially because we update our site once a week, sometimes even in two weeks. You are a welcome guest in the land of decorated windows. You may find the windows of your dream, notice how windows vary with territories, and enjoy thousands of photos showing carved, shuttered, painted, not painted, new and old, nice and gorgeous decorated windows innumerable in their diversity. I want to come to Russia and see them! Are you considering organising small tours?? !